The days I can’t afford to drop $35+ on salon-grade hair strengthening products (and heck, even the days I can), this is one of my all-time favorite, easy organic DIY hair treatments. The best part –one ingredient. I try to start with my hair freshly shampooed and damp. Using my fingers or a small spoon, I’ll scoop out roughly a teaspoon, rub it for a few seconds between my palms to soften/melt the oil, then apply it with my fingertips straight to my hair -beginning about mid shaft and working my way to the ends. I continue scooping out small amounts until all the little bits I want to be covered are covered -the product is easier for me to manage this way rather than in one huge glump. Using a wide-tooth comb (or my fingers if I’m particularly lazy that day), I’ll rake the product through to ensure it distributed evenly. With the product in my hair, I tie it all up on top of my head with a fabric hair tie, large jaw clip, or a few oversized bobby-pins. The time I leave it in kind of depends on my mood or the dryness of my ends. Ultra dry: I’ll throw on a super attractive shower cap or wrap my head in an old towel and over-night it. Moderately dry: I used to just keep it in for a few hours while I wrote my homework for an evening,or now while I’m doing housework. I’ve even read people storing in in their tub and just using it while they showered a few times a week –it isn’t a science. Tailor the process to your needs. Ta-da! Hello silky locks. It’s that simple. 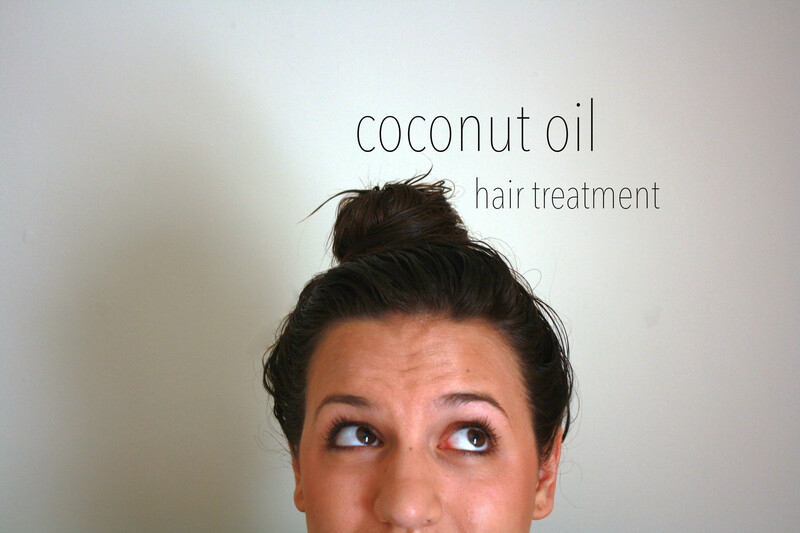 I love coconut oil for everything too – body, hair, dry feet – it’s so amazing!